Production I.G. announced that they will be releasing a limited edition CD single for the Oasis song, “Falling Down“. It will also include a DVD with a music video for the song animated by Production I.G. and it is set to be released in Japan on May 27th. If anyone was concerned the DVD will include the original “Falling Down” music video. The supernatural manga Majin Tantei Nōgami Neuro ended its run on Monday after four years of being published in Shueisha‘s Weekly Shonen Jump magazine. The manga written by Yusei Matsui focused on a demon named Neuro Nougami who feasts on riddles. Sounds like a twisted version of Yu-Gi-Oh, to me. A promotional video is up for Saint Seiya: The Lost Canvas, which will be released on DVD in Japan on June 24th, an OVA prequel to the original series. The OVA is about the friendship of Tenma and Alone who later become mortal enemies. TMS Entertainment are also streaming the trailer on their Youtube page. If you’ve been experiencing symptoms of despair as of late then would you please let out a collective sigh of relief. A third season of Sayonara Zetsubō Sensei has been green-lit and will premiere in July. Zan Sayonara Zetsubō Sensei will continue to follow Itoshiki Nozomu, the most negative person in the world who just so happens to be a high-school teacher. Don’t you feel better already? Sunsoft producer Tomohiro Seki announced that his company has upcoming anime plans for Leiji Matsumoto‘s latest manga Out Of Galaxy Koshika. It’s about a beautiful woman and a young boy aboard a dimensional ship who journey to save the Earth. Sounds a bit familiar. Too familiar. 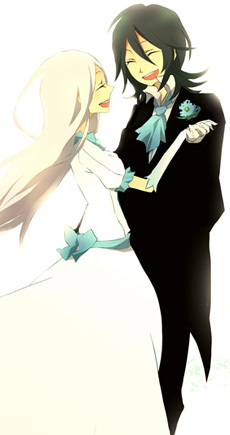 Seki also revealed that the manga will be available on Apple’s iPhone and iPod touch. Dragonball: Evolution has officially dropped out of the Top 10 in the U.S. box office. It opened up at #8 with a $1,575,000. Since the new numbers it’s estimated at $7,825,000 and $44,692,875 worldwide. Anybody see this yet? The title of Rumiko Takahashi‘s brand spanking new manga is Kyōkai no Rinne and it follows a girl named Sakura Mamiya. She has the ability to see ghosts after something happens to her when she was younger. It’s not exactly what you’d call original, but I hope this is in the vein of Takahashi’s darker Mermaid Forest manga. The series will premiere in Shogakukan‘s Weekly Shonen Sunday magazine and in North America through Viz Media on TheRumicWorld.com on April 22nd. Good news for those of us who’ve started the Zac Efron as Sousuke Sagara bandwagon; the young actor told the MTV Splash Page that discussions for the live action Full Metal Panic! are still “very early” and that the film is “to the point where it’s more than likely not going to happen.” I’m assuming that after the disaster known as Dragonball Evolution I’d be a bit reluctant to jump on board too. It’s been announced that the eighth and final DVD installment of the Clannad After Story anime will include a special episode that is an alternate world arc about Kyou Fujibayashi. The episode is titled, “Another World: Kyou Arc” and the DVD will be released in Japan on July 1st. A second season has been green-lit for the Hetalia – Axis Powers anime and will premiere this summer on the internet and mobile phones (in Japan only.) The series re-imagines various historical eras where its characters are archetypes of their countries. For those of you who have been waiting for the English reiteration of Honey And Clover and NANA can finally get excited about something. Viz Media announced that they have set up websites for both anime where viewers will be able to buy, download-to-own, and/or stream the two series in the near future. It was announced in the EVA-EXTRA01 paper magazine that Maaya Sakamoto is set to play a brand new character in the second film in the Rebuild Of Evangelion quadrilogy. 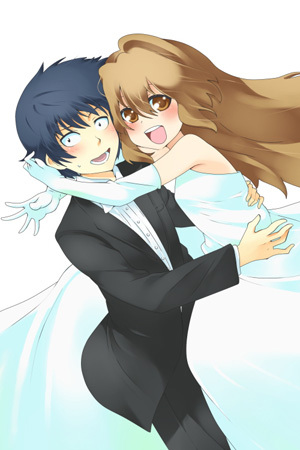 The character’s name is Makinami Mari Illustrious and she shares the EVA tradition of having parts of her name to be named after World War II ships. It was also confirmed that Yuko Miyamura will reprise her role of Asuka, however with the new name of Shikinami Asuka Langley instead of Sohryu. If you haven’t already seen it then head on over to TMS Entertainment‘s new Youtube page to watch the anime classic, Sherlock Hound. The series features Sherlock Holmes, his assistant Watson, and the housemaid Mrs. Hudson re-imagined as animals solving mysteries. The first six episodes are directed by Hayao Miyazaki. A live-action feature film adaptation of Full Metal Panic! is being developed by Mandalay Pictures with Zac Efron as the potential star. Mandalay hasn’t set up a studio for the film yet, but the company does have a first-look deal with Universal. I can only see this adaptation going two ways – the Dragonball Evolution way and then the Transformers route. Personally I vote for the latter. Square Enix made an announcement in its Young Gangan magazine that four new titles will be launching in the next four issues of the magazine. The four titles includes Atsushi Suzumi (Venus Versus Virus) doing Nightmare Go Round, Izumi Kirihara (Hitohira) is doing Akira to Hiyori, Yuji Iwahara (King of Thorn) will be doing a title that has yet to be named, and Yuki Azuma (Dark Blue) will also do a title that has yet to be named. The FUNimation Channel has announced that it will be running new Viz shows on its channel sometime late spring and summer. The shows in question will be NANA, Honey And Clover, Monster, Buso Renkin, and Hunter X Hunter. Leonardo DiCaprio is considering casting SMAP as the Ninja Scroll live-action feature film adaptation’s main cast. It was announced last year that DiCaprio’s production company Appian Way had picked up the rights for the film. DiCaprio expressed that he wanted to make all the fans of the original film happy and to make sure that they put their best effort into the making of the film. At least Ninja Scroll sounds like it’s in “good hands,” but Leo just doesn’t come off as someone who’d be into anime. The third Naruto Shippūden film, which shares the same title as the 99th episode in the original Naruto series is Hi no Ishi o Tsugumono (lit. The Will Of Fire Still Burns), will open in Japanese theaters on August 1st. Detroit Metal City singer Hideki Kaji was beat up and robbed in Sweden while watching over filming equipment which was stolen. It was reported on Kaji’s official website that he was doing well. The Swedish police have yet to determine the identity of the assailants. It was reported that a new Hidamari Sketch special had been green-lit for production. The announcement was made at the “Chō Hidematsuri Z” event that was held in Tokyo. A promotional video is up for the slice of life, romance anime series Hatsukoi Limited on its official website. The official website for the anime adaptation of Guin Saga is streaming an English dubbed trailer. I can’t say much for the dubbing, but this series looks like its going to be great. FUNimation is offering the new Fullmetal Alchemist anime on their website for streaming on April 9th at 12pm; four days after the Japanese airing. With it becoming increasingly popular these days for companies to distribute anime on the web, Bandai Namco plans to join all the others by offering its Gundam franchise in ten different languages on the internet sometime this year. FUNimation also announced that it has signed a partnership with Toei to release – Air Master, Captain Harlock, Digimon Adventure 02, Fist Of The North Star, Galaxy Express, Pretty Cure, and Slam Dunk on its website. I believe I already know what two series I plan to check out. It was announced that a manga spinoff of the popular Capcom video game Gyakuten Saiban (Ace Attorney) will be on the prosecution’s side and it is entitled Gyakuten Kenji. The manga will premiere in Kodansha‘s Weekly Young Magazine on April 13th. A new manga adaptation of Tales Of The Abyss entitled Tales of the Abyss -Tsuioku no Jade- is scheduled to start April 24th in Kadokawa Shoten‘s Asuka magazine. A second promotional video is being streamed for Shangri-La on its official website. Kamikaze Douga is streaming a promotional video for its anime short Amanatsu on its website. It was announced at the end of the 25th episode of Mobile Suit Gundam 00 Second Season that a film was in the works and will open in Japanese theaters in 2010. So that should be plenty of time for me to catch up with both seasons. The second promotional video for Sengoku Basara, a video game adaptation for the Playstation 2, is up for streaming at the official website. It premieres April 1st. It was announced by GDH that the company will sell off its game development subsidiary Gonzo Rosso. The company plans to refocus itself on its animation business with Gonzo. I’ve never played any of their games, but I’m sure this is sad news indeed for somebody. Yoko Kamio‘s Matsuri Special SP manga spinoff will be in the July issue of Shueisha‘s Deluxe Margaret magazine. In the same issue will be Kazune Kawahara‘s Enkoi Debut which is the follow up to High School Debut. The artist behind the manga versions of Blood+ and Le Portrait de Petit Cossette is starting two new mangas in April and May in Square Enix‘s Young Gangan magazine. The manga series Twin Spica is getting a live-action TV drama on June 11th. The series will be broadcast on the NHK and actress Nanami Sakuraba is set to play the lead. The next manga for Hellsing creator Kouta Hirano will be featured in the Shonengahosha‘s Young King Ours magazine and its title is Drifters. I’m curious if this will include Hirano’s trademark craziness or not. The president of Sunrise, Kenji Uchida, had previously announced at the Tokyo International Anime Fair that the deciding factor to go ahead with the 20th Century Fox live-action adaptation of Cowboy Bebop was the casting of Keanu Reeves. Reeves made two visits to the studio to express his interest in the project which Uchida states was what made the deal go through. Interestingly enough Uchida noted that negotiations between the two companies went on for two years until it was agreed upon that Sunrise assert quality control. His exact words were, “If the script is terrible, the live-action film adaptation will not be approved.” Perhaps the film will exclude Reeves’ popular “I know kung fu” and “Woah” quotes. Senjō no Valkyria -Gallian Chronicles- promotional video from the Tokyo International Anime Fair is streaming at the official website. The video game sounds interesting, but since I’m too lazy for video games these days hopefully the anime will be a good substitute. FUNimation and GDH have announced a strategic alliance in which FUNi will stream its current and future works on their official website. There will also be a download to own feature on their site and others yet to be announced. Tact Aoki is directing The Asylum Session 3D, a 60-minute 3D computer-animated film, that’s scheduled for release in two theaters this summer in Tokyo and Osaka. Kazuya Minekura announced that her current manga project Saiyuki Gaiden will end this May. This July Kadokawa Shoten plans to launch a new magazine entitled Young Ace and it will see the return of Yoshiyuki Sadamoto‘s Neon Genesis Evangelion, MPD-Psycho, Summer Wars, and Nagato Yuki-chan no Shōshitsu. 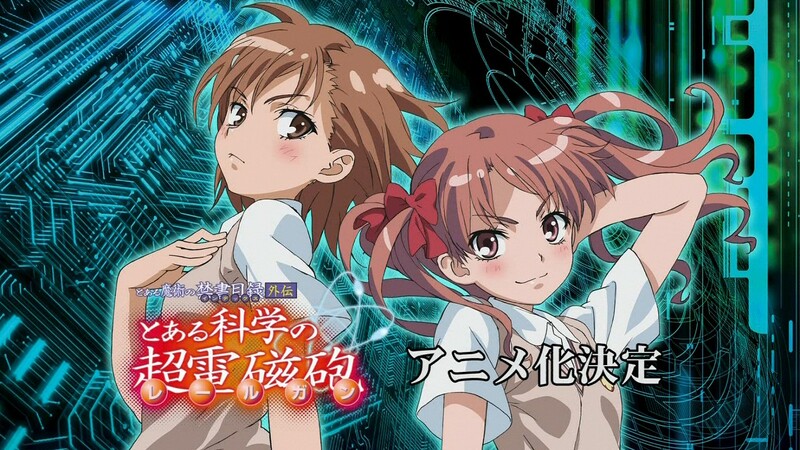 The To Aru Kagaku no Railgun anime was announced in a flyer and an onscreen image at the end of the final episode of To Aru Majutsu no Index. I’m sure Omni will talk about it more when he writes that up. The trailer for Kōkyō Shihen Eureka Seven: Pocket ga Niji de Ippai has been posted on its official website. The film is set to open in Japan on April 25th. Satoru Nagasawa of Maria-sama ga Miteru fame will remake Yukari Ichijo‘s Nichiyōbi wa Issho ni manga in Shueisha‘s Margaret magazine’s next issue. A new Space Battleship Yamato set 21 years after the original will see a theatrical release in 2009. The project was revealed in August when Yoshinobu Nishizaki announced Yamato Studio was built in Tokyo. Ken’ichi Kasai will be directing the Aoi Hana anime which is based off the yuri manga. The official website has launched a staff list and a promotional video (which apparently doesn’t have any actual animation). A promotional video is up for NisiOisin‘s Bakemonogatari anime adaptation. Akiyuki Shinbo is set to direct, Akio Watanabe on character designs with Satoru Kousaki composing the score. At the Tokyo International Anime Fair 2009 this past Wednesday Crunchyroll announced that it will continue the following series: Gintama, Naruto Shippūden, and Shugo Chara!. They are planning to stream: Black Jack Special: The 4 Miracles Of Life, Catman, Chi’s Sweet Home, Mainichi Kāsan, and Saki. Toei Animation revealed Toei Robot Girls anime at the Tokyo International Anime Fair. The project will include girls dressed up as the various mecha in Toei’s catalog. Masamune Shirow and Lucent Pictures Entertainment shared their Squad collaboration at the Tokyo International Anime Fair. A tagline of, “A battle for the front mission — I’ll cover your back” was included, but no other release details were presented by the company. At the Tokyo International Anime Fair the Toei booth announced that they were hard at work on a feature film entitled Niji-Iro Hotaru ~Eien no Natsu Yasumi~ (Rainbow-Colored Fireflies: The Eternal Summer Vacation~.) There were two pictures taken of the booth: 1 | 2. A promotional video for Hellsing Ultimate VI has been posted after it made its rounds at the Tokyo International Anime Fair this week. Sunrise and Summer Days With Coo director Keiichi Hara revealed at the Tokyo International Anime Fair that they are working on a new film adaptation of Eto Mori’s Colorful for a possible 2010 opening. The English trailer of Musashi: The Dream Of The Last Samurai, a collaboration between Mamoru Oshii and Mizuho Nishikubo, was posted at Anime News Network. Oshii developed and wrote the story with Nishikubo directing. The film will get a summer theatrical release. A promotional video has been posted for Kenji Kamiyama‘s Eden Of The East. Chika Umino is providing character designs, Kenji Kawai will do the score, and Yusuke Takeda on art direction. Surprisingly enough is that English rock band Oasis will provide the opening theme, “Falling Down.” I don’t know about Oasis doing the opener, but this anime looks damn beautiful. Pokémon Mystery Dungeon: Explorers Of The Sky has been green-lit as an anime adaptation. It will premiere April 12th on the Pokémon Sunday variety program. The Fanroad anime magazine ended it’s 29 year old run this Saturday with it’s April issue. The magazine was a spinoff of Big Comic magazine and it specialized in reader-submitted art and manga. Toy maker Yamato posted in their blog a multimedia project called Enka Ōdō Dai Shōgun. The project will include an anime adaptation by Studio Anima, illustrations, figures, novels, manga, drama CDs, and 3D computer graphics. The live-action Dragonball film opened as the #1 film in five of the eight Asian markets. The film opens in the United Kingdom on April 3rd and the United States on April 8th. I imagine this film turning out to be so bad that it’s good. Anybody else agree? Anon Pictures plans to exhibit the slapstick comedy Inuwari-san at the Tokyo International Anime Fair (TAF). Keiko Yamamoto will play the canine police officer who loves law, order, and tea. Shirow Miwa debut manga Dogs will get an anime adaptation this summer with the fourth volume of the manga Dogs: Bullets & Carnage. The official website has launched with a promotional video. The adult-adventure game Princess Lover! will be getting an anime. Hiromitsu Kanazawa will be helming the project as director with Makoto Nakamura doing the scripting. The official website promises an update March 18th. The Kampfer light novel series has an anime adaptation in the works. Toshihiko Tsukiji also wrote the Maburaho light novels and the Umi Monogatari ~Anata ga Ite Kureta Koto~ pachinko games. Lucent Pictures Entertainment and Studio 4°C are launching a new animation studio called Lucent 4°C (LFC). The first joint project will be announced sometime at the end of the year. The Fushigi Yuugi: Genbu Kaiden manga will not resume until spring of 2010. Manga-ka Yuu Watase announced through her website that the delay is due to her physical condition and her commitment to her other titles. 4Kids Entertainment announced yesterday net losses of US $19.6 million in the last three months of 2008. Net revenues dropped to $14.3 million and contributed to the increase of total losses of the year as a whole. Doesn’t look so good for 4Kids. Hopefully 4Kids sees this as a sign that it’s time to stop focusing so much time selling toys to kids and spending a bit more time on the original material. Takashi Ikeda‘s Sasameki Koto yuri manga was green-lit for an anime. Manga-ka Rumiko Takahashi‘s latest work starts in the 16th issue of Shogakukan‘s Weekly Shonen Sunday magazine on April 22nd. The issue also marks Shonen Sunday’s 50th anniversary in which a special 30-page one-shot by Takahashi and Mitsuru Adachi will be published called My Sweet Sunday. According to Yahoo! research, Wikipedia is the third most credible source of information media in Japan. It fell behind newspapers and radio, but surprisingly it beat out television. Crunchyroll has announced that it will stream a worldwide simulcast of the Katekyo Hitman Reborn! anime. The episodes will be available for it’s Anime Subscribers within an hour they premiere on Japan’s TV Tokyo station every Saturday at 10:30 AM (Friday at 9:30 PM EDT). At the Tokyo International Anime Fair Studio Bones announced an original series entitled Tokyo Magnitude 8.0 this July. The series is about the 70% or higher possibility that a magnitude 7.0 earthquake will happen in Tokyo sometime in the next 30 years. The anime will follow a what-if scenario if an 8.0 earthquake took place. I really enjoyed Xam’d Lost Memories so I think this will be a series I’ll watch.  Full Moon wo Sagashite mangaka Tanemura Arina will be launching a new manga in January called Sakura-Hime Kaden in the shoujo manga magazine Ribon. Saboten no Himitsu’s Haruta Nana and Aishiteruze Baby’s Maki Youko will also be starting new manga series in Ribon in the new year.  Happy Happy Clover’s Tatsuyama Sayuri will be starting a new manga in Decemeber called Kumappuri.  Mangaka Sawai Yoshio‘s (who previously worked on Bobobo-bo Bo-bobo) Chagecha series has ended.  The manga Boys on the Run will be getting a movie next fall. The manga has been halted for some time, but will be restarted next spring.  The Beat has posted a chapter of Black Jack for free viewing to celebrate Halloween. A promotional video for Rintaro‘s Yona Yona Penguin is being streamed. A worldwide release for the film is scheduled September 2009. A new PreCure series will be airing February 2009. The Negima Ala Alba second OAD will be shipping on November 17. The official website has posted promotional videos which can be viewed here. Hulu has added dubbed episodes of xxxHolic for free viewing. Shonen Jump has announced that they will be streaming Dragonball, Dawn (One Piece), and Tegami Bachi specials November 24. The website for the live-action movie Neko Rahmen is streaming a new trailer, the film has been set for release in Japan November 29. Funimation is presenting the first episodes of Afro Samurai, Burst Angel, Basilisk, and MoonPhase for free via iTunes. In this week’s episode of Hayashibara Megumi‘s Heartful Station radio program, it was revealed that Slayers EVOLUTION-R will be starting in January 2009. The OP will be called Front breaking, and the ED will be called Sunadokei (lit. Hourglass), and the CD with both will be out in February. If you find anything that you think I should mention on any particular day’s Daily Dose, please send me (not Omni) an email with the words “ANIME NEWS” somewhere in the subject line. ToHeart2 artwork at left courtesy of バーニア600 on pixiv (account needed to access). Vipers Creed, a series about members of a private military company after a great war, will be coming January 2009. It will be directed by Appleseed director Aramaki Shinji. Shipwreck harem story 15 Bishoujo Hyouryuuki, created by Tsuyokiss creator Takahiro and Kuroda Kazuya, will be getting an OVA. Anime Festival Asia and DarkMirage have conducted an interview with Macross Frontier singer May’n. The Yoku Wakaru Gendai Mahō light novels will be getting animated. A new Prince of Tennis manga will be starting in March. Aria mangaka artist Kozue Amano will be launching the manga Amanchu! November 29. Bandai has posted an english trailer of CODE GEASS R2. The first episode will be airing this Sunday on Adult Swim. The live-action sequel to Higurashi no Naku Koro ni, Higurashi no Naku Koro ni Chikai will be open in theaters May. The 13th Detective Conan film, Detective Conan: The Jet Black Chaser will be opening in April. 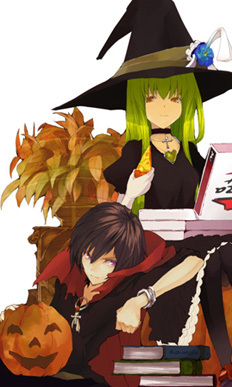 CODE GEASS Halloween artwork at left courtesy of つき on pixiv (account needed to access).  Seto no Hanayome will be getting a two part OVA. The first part will be shipped on November 28, while the second will follow up on January 30. A streaming commercial has also been released, which can be viewed here.  xxxHOLiC is getting a two part OVA called ×××HOLiC Shunmuki. The two parts will be released on February 17 and March 15. The official website for Black God has posted a few screenshots from the first episode. The first half of Switch OVA 1 is available for free viewing here. Ashita no Joe manga artist Tetsuya Chiba is in the works of creating a 2-part 90 page manga called Tomogaki. Death Edge (manga) has just been launched this week, the summary details on “angels” in a fictional town that are fighting a holy war. The manga Jinki -Shinsetsu- has ended in Japan. The manga Dokuro-chan Ripiru has also ended in Japan. Crunchyroll has partnered up with Toei Animation to bring english subtitled episodes of Slam Dunk, Fist of the North Star, Digimon Adventure 02, and Pretty Cure! on a weekly basis for streaming and downloading. 3 people were arrested for stealing a Dragon Ball vending machine last week. Gundam 00 artwork at left courtesy of シチ on pixiv (account needed to access).  Pani Poni Dash will be getting a new episode with the release of the DVD-box March 2009.  Tenchi Muyo-inspired Isekai no Seikishi Monogatari will be getting animated.  A Gundam “surprise” project is underway to mark the franchise’s 30th anniversary.  The next Tsubasa Chronicle OVA will be called Tsubasa Shunraiki and will be two episodes released on March 17 and then April 17th.  Slayers will be getting a 5th series titled Slayers EVOLUTION-R; this will be a sequel to Slayers REVOLUTION. (Promo video): Major the movie will be out in Japan December 13. Morning 2 will be posting 3 of their issues online for free. Resident Evil: Degeneration will ship in North America December 30. Top Shelf will be publishing AX Anthology. Bungaku Shoujo will be getting a second manga adaption. 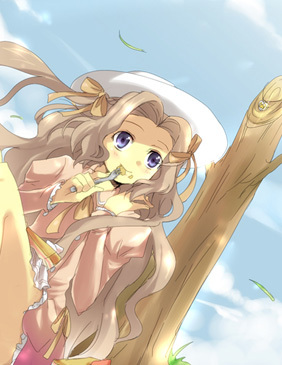 Nunnally artwork at left courtesy of kl on pixiv (account needed to access) in celebration of her birthday yesterday. Hey everyone, a lot of events that have occurred recently left Random Curiosity in a pinch, well kinda ^^’. Divine was a great asset but unfortunately he has left for personal reasons, leaving Omni to once again man the fort on his own. Over the past few months I’ve noticed that the Daily Dose hasn’t made much of a presence like it used to. It was a convenience since it supplied information that everyone looked forward to reading and I felt it made Random Curiosity unique in its own way. I’ve recently contacted Omni and offered my help by doing the Daily Doses in his place. I’m looking forward to working with all of you. Hetalia Axis Powers is getting animated. Higurashi no Naku Koro no Rei (5-part OAV) will begin airing late December. Kiss x Sis will be getting animated on DVD. Black God is getting animated. A new season of Full Metal Alchemist has been confirmed. Haruhi-chan, Churuya-san will be getting anime shorts. Gonzo will be animating Dungeon & Fighter (Slap Up Party -Arad Senki-). Hatsukoi Limited is getting animated. Asakiyumemishi is getting animated and will premiere next January. Minami-ke is getting a 3rd season. Denpateki na Kanojo is getting animated. Souten Kouro is getting animated. Zettai Yareru Greece Shinwa is getting animated. Hajime no Ippo will be getting a new series January 2009. Koi Hime†Musou is getting an OVA. Sunrise‘s new upcoming series is Sora wo Kakeru Shoujo. Spice and Wolf‘s second season has been confirmed. Asura Cryin’ is getting animated. Sengoku Basara is getting animated. 428 ~Fuusa Sareta Shibuya de~ is getting animated. Street Fighter IV will be getting an anime adaption. Project MP will be getting an anime adaption. Kemono no Soja will be getting an anime adaption. Before Green Gables will be getting adapted into an anime. Kannagi artwork at left courtesy of 真琉樹 on pixiv (account needed to access). Much more accumulated news after the jump! If you’ve been wondering why I haven’t written one of these posts in about three weeks, it’s because I’ve been in the middle of a move and haven’t had much time to do anything extra over the shows I’m blogging regularly. Things haven’t quite settled down yet, so my schedule’s still in a bit of a flux, but I didn’t want to put this off any further since there’s so many new series announcements, PVs, etc piling up. Unfortunately all this also means that I won’t have time to continue keeping up with Tetsuwan Birdy like I wanted to, so I had to drop that. Remember that show Dragonaut from earlier this year that was heavily panned? The show’s official website has posted a preview for the DVD episode 26 that’s due to be released in September. I feel like I should watch it if for no other reason than to make fun of it. The anime adaptation for the shoujo manga Skip Beat! – coming this October – will feature Inoue Marina as Kyoko and Miyano Mamoru as Shou.